I've been with MDaemon Technologies since March, 2007. As Technical Marketing Specialist, I provide a variety of services to educate and inform, including technical and sales training for our global network of partners, public webinars and personal demos for customers, collateral materials such as how-to guides, sales guides and datasheets, marketing and tutorial videos, social marketing (blog, Twitter, Spiceworks, Facebook, YouTube & LinkedIn), and much more. Before the invention of email, mail that arrived in your physical mailbox often contained pamphlets, sales brochures, credit card offers, and product catalogs. Much of this waste was thrown away and ended up in a landfill somewhere. 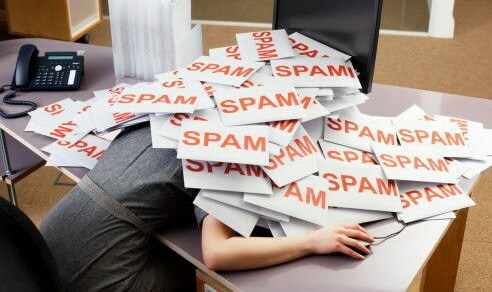 Today, the equivalent and often more annoying nuisance is spam. Spam comes in many forms, and has evolved from dubious product claims, miracle supplements, conspiracy theories, and offers of easy money to more malicious threats such as ransomware attacks and targeted spear-phishing. While the amount of spam as a percentage of total email traffic has gone down recently, the severity of email-borne threats has increased. So how can users protect themselves from becoming the next victim to these malicious threats? There are numerous spam fighting tools in MDaemon and other mail servers, but server-side tools are only half of the spam-fighting equation. The other half is user education. With this in mind, here are 10 things users can do to reduce the amount of spam they receive. Unsubscribe – How often have you been asked by a store clerk for your email address or placed an order online? In either of these situations, chances are you may have ended up on a company’s mailing list. When you receive email from these companies, take the time to open the message and click on the Unsubscribe link. But first, make sure the email is in fact coming from a reputable company (Here’s how). If you’re not completely sure where the email came from, then report the message as spam instead of unsubscribing. Create a secondary email account – While we’re on the topic of retailers having your email address, you might also consider having a second email address that’s used solely for the purpose of store records or placing orders. This allows you to keep solicitations from these vendors out of your primary inbox. Keep your email address private – If your email address is visible on social networking sites like Facebook or Twitter, then it’s also visible to spammers. Spammers have tools that can easily detect visible email addresses and add them to their mailing lists. This is why it’s often recommended that, if you MUST use your email address on one of these sites, you mask it by changing its format. For example, type out “at” instead of using the “@” symbol. With the prevalence of Business Email Compromise (BEC) attacks, it’s even more important for executives to be mindful of posting their email address or other personal information, as scammers will use this information to send out well-crafted spear-phishing emails. Don’t reply to ANY spam or unsolicited marketing messages – Most spam messages use forged sender (return-path) addresses, so replying to a spam message will almost never result in the spammer getting your message. Replying to legitimate marketing messages tells the sender that your email address is valid, and thus, they may continue to send you spam. Never click on links – Often, when you click on a link in a spam email, it specifically identifies you to the spammer as having received the message. Not only can clicking links in spam messages identify you to the spammer; you can also end up getting infected with malware. Block Images – Even if you don’t click any links, an image opening in your email can alert spammers to a valid address. Spammers often try to be stealthy by inserting images that are only one pixel wide. If your mail client is configured to automatically open images, spammers can be alerted that your email address is valid. We recommend configuring your email client to automatically block images to reduce spam. You can always choose to view images in specific emails if you are sure the sender and content are legitimate. Make your email address unique – Spammers often use common names to try to guess email addresses. If your email address is unique, it makes it harder for spammers to guess your email address. Don’t fall for scams – If you receive an anonymous email from someone who appears to be in dire need, who promises you large sums of money for your small up-front investment, you may be witnessing the familiar Nigerian email scam, or one of many other variants. What are the odds that someone you’ve never met, who’s in a desperate situation, would contact you for help? Don’t fall for this scam. Never forward email from someone you don’t know – I often see email messages with some type of public service announcement, petition, or other bit of advice, and often, there’s a request to forward the message to your friends. Don’t fall for this, as it’s a prime opportunity for spammers to harvest email addresses. Blocking junk email is not just the job of the mail server administrator. A well-informed email user can mean the difference between spam that is manageable and spam that is out of control. These ten tips will help you reduce spam, and help prevent you from becoming a victim to phishing or malware. As hurricane Florence threatens the east coast with high winds, heavy rainfall and flooding, businesses could potentially lose access to critical communication services. When Hurricane Harvey hit Texas and Louisiana last year, we offered free temporary assistance for those without email services. For those affected by Florence, we are again here to help. 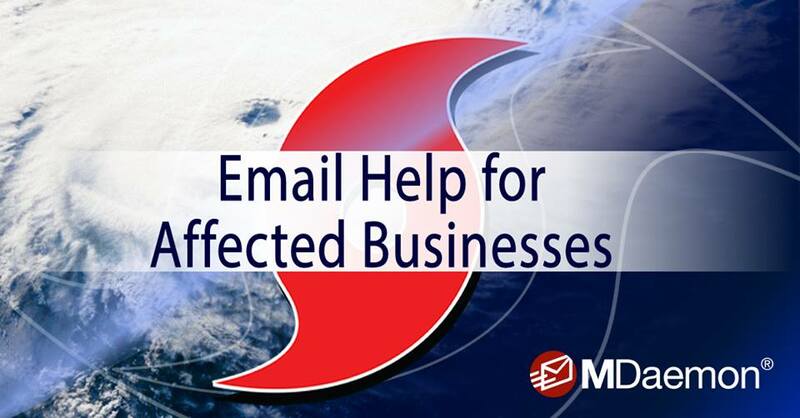 We’re offering affected businesses free temporary email hosting using your existing domain or temporary email accounts on our hosted webmail platform. Click here for more information, and be safe! Are you a little over-zealous with the Send button? Message Recall to the rescue! Nature dictates that we human beings are prone to make mistakes from time to time. For example, if you attached a picture from your toddler’s birthday party in an email to your customer when you meant to attach your customer’s invoice, if you noticed an embarrassing typo after a message was sent, or if you got a little overzealous with your personal information that, after giving it a second thought, might be damaging to your career. Most of us have found ourselves in one or more of these situations at one time or another. That’s why it’s important that your email solution have a Message Recall feature. Message Recall gives you a “second chance” to correct an error or avoid a situation that could be embarrassing or damaging to your career. MDaemon users have three ways to recall a message. 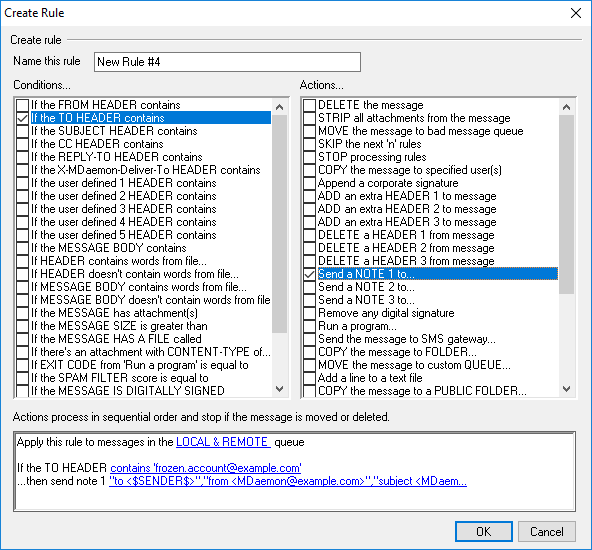 Using the Recall button in MDaemon Webmail. Attaching a copy of the sent message to an email addressed to the MDaemon System account with RECALL as the message subject. Sending a message to the MDaemon System account with RECALL plus the Message-ID as the message subject. The instructions in this video can also be found in this knowledge base article. This is just one of many features you’ll find useful in MDaemon. If you’re not yet an MDaemon user and would like to know more about it, download your free trial and see for yourself how easy it is to use, and be sure to leave us a comment if you have questions! Are you a little hasty with the Send button? Avoid costly mistakes with Deferred Delivery! Let’s face it. We all make mistakes. 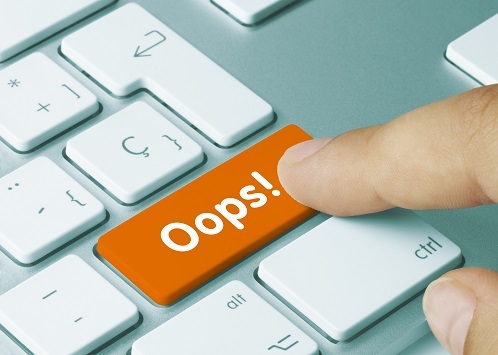 At one time or another, most of us have gotten a little hasty with the Send button when composing an email, and sent it to the wrong Frank Thomas, accidentally CC’d the customer in an inter-office communication, or realized the email was probably not such a good idea in the first place. These examples can be quite embarrassing, but other mistakes can result in legal trouble for you or your company. For example, healthcare providers can violate HIPAA regulations by sending an email containing protected health information (PHI) to the wrong person. Penalties for these HIPAA violations can be steep, ranging from $50,000 to $1.5 million. To avoid these situations, your email solution should have a feature that lets you delay delivery of a message. With MDaemon Webmail, message scheduling options are just a mouse click away. There are many reasons why one might want to defer delivery of an email message. Delaying message delivery for an hour or even a few minutes gives you time to take a break from it and review it with a refreshed perspective – providing another opportunity to catch errors you might have missed before. Some email conversations go back and forth too quickly, so you might respond before you have all the information or ask questions that are already answered in the next message. Deferred delivery allows you to slow the process down so you’re not having to play email tag. Deferred delivery can help prevent you from sending an angry email response during heated discussions. Allowing yourself a little extra time to re-think your message or to cancel the message altogether can help prevent a great deal of workplace conflict. For companies that operate globally, deferred delivery allows users to schedule messages for delivery during peak business hours in the recipient’s country, increasing the likelihood that it will be seen. We demonstrate how to defer delivery of an email message in MDaemon Webmail in this week’s tutorial video. Would you like to learn more about this and other MDaemon features? Click here to schedule a personal demo of MDaemon. Deferred Delivery is explained further here in the MDaemon Help file. Here’s a handy list of features, or you can download your free trial of MDaemon and see for yourself how easy it is to use! On our next post, we’ll discuss MDaemon’s message recall feature and demonstrate three ways to recall a message, so check back soon for more tips & tricks! Most of our customers are small-to-medium businesses with limited IT budgets across a variety of industries – including healthcare, education, manufacturing, and government. Having a limited IT budget often means having limited staff available for troubleshooting email or tracking down messages, so when considering which email gateway/spam filter you want for your business, one of the main criteria to consider is how easy it is to find messages for your users. Users who are expecting business-critical messages need to know ASAP what happened if that message is not delivered. With SecurityGateway, it’s easy to find out if a message was rejected, quarantined or delivered. If it was rejected or quarantined, color-coded transcripts make it easy to determine exactly why the message was not delivered. Let’s have a look at the message log and its layout. Use buttons across the top to search messages, view message details, redeliver, whitelist or blacklist, or perform other actions. Search for messages. Advanced search options are provided, allowing you to find messages based on a variety of criteria, such as message contents, delivery date, the result of the message delivery attempt, keywords in a message header, and others. Redeliver the message. Note that if the issue that made a message undeliverable still exists then the message will return to the message log with the same status. Press the blue buttons to enable or disable specific columns. The left & right-facing arrows indicate inbound and outbound messages. The right-facing blue arrows indicate outbound messages, and the left-facing green arrows indicate inbound messages. Now that we’re familiar with the layout of the message listing, let’s review how to troubleshoot email delivery issues. Key events in a message’s transcript are color-coded for easy identification. In the following example, the message was scanned by SpamAssassin. During this process, it accumulated 1.7 points. It was then scanned by Outbreak Protection, during which it accumulated an additional 5.5 points. Finally, the total message score was tallied with a final score of 12.2 points and was rejected. We’ve created the following video to help you become more familiar with message tracking in SecurityGateway. Would you like to learn more about how SecurityGateway can protect your business from spam, phishing attempts and malware? Click here to download your free trial! Administrators can Save Time by Letting SecurityGateway Users Manage Their Own Quarantines. Learn More with Our Latest 30-Second Email Tips Video! In June 2018, spam made up a staggering 85.32% of all global email traffic. A good spam filter & email gateway will filter out most of these malicious email messages circling the globe so that users and administrators can spend more time focusing on their business. SecurityGateway for Email Servers was designed to make it easy for small-to-medium businesses to manage their inbound and outbound email security needs without taking up too much time that could be spent on more business-related tasks. It reduces the workload on administrators by providing automated user & domain creation and periodic quarantine report emails for end users. The focus on today’s “30-Second Email Tips” video is to demonstrate the quarantine report emails which allow users to manage their own quarantines so you can spend more time focusing on your business. We’ve created the following video to demonstrate these features. SecurityGateway helps meet the needs of businesses that want an additional layer of security for their existing email server and businesses running Microsoft Exchange or another mail server that has cumbersome controls or a confusing interface – helping simplify the process of scanning inbound and outbound email for malicious content. Click here to learn more about SecurityGateway, or click here to download your free trial! Can you Have an Auto-Responder on a Frozen MDaemon Account? I’ve heard various opinions on what to do with an MDaemon account belonging to someone who has left a company. In a recent post on our community forums, an MDaemon administrator had set a former employee’s account to Frozen, and then configured an auto-responder for the account. 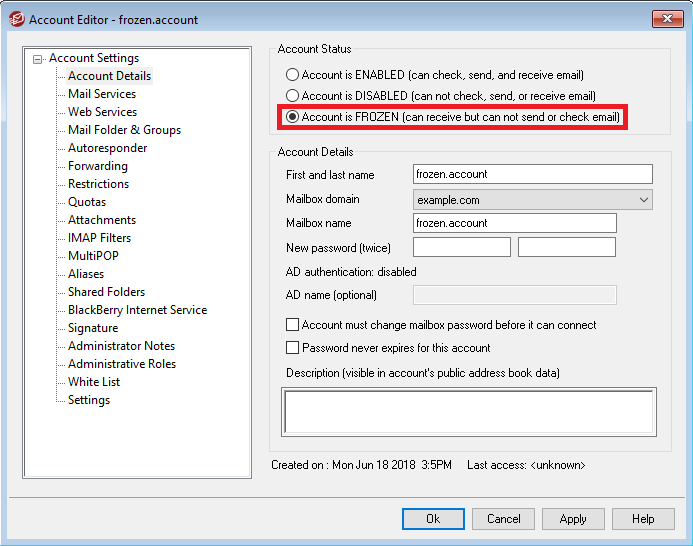 Frozen accounts cannot send outbound email, and the user of a frozen account cannot check for new email. Select this option if you wish to allow the account to receive incoming messages but prevent it from being able to check or send messages. This is useful when, for example, you suspect the account has been hijacked. Freezing the account would prevent the malicious user from accessing its messages or using the account to send messages, but it would still be able to receive its incoming email. The result of this is that auto-response messages from frozen accounts to external (non-local) addresses are sent to the Holding queue (more information on the Holding queue can be found here). Let’s say an employee has left the company. As the MDaemon administrator, I don’t want that employee’s account to be used, so I place it in Frozen status via the main Account Details screen of the account editor, as shown here. Now let’s say I’ve enabled an auto-responder for the account, as shown here. In the following example, I’ve created the account frozen@brad.ssllock.com, and have configured the auto-responder. The result is that the auto-response never gets sent because the account is frozen. 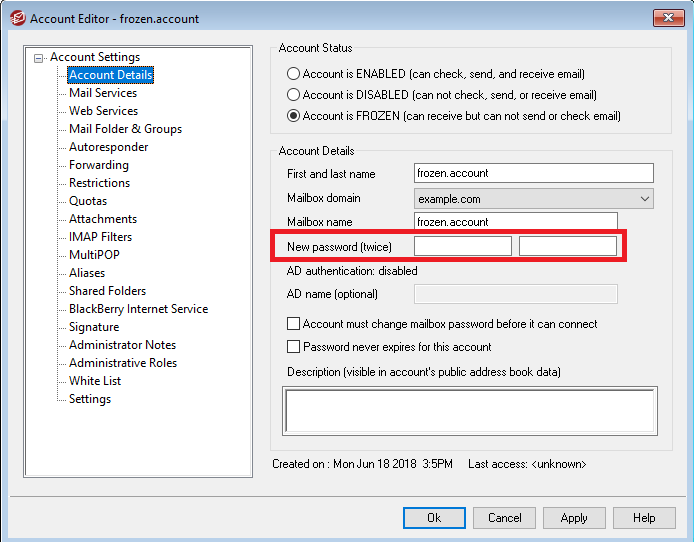 Rather than freezing the account, you could simply change the account’s password so that it can still accept mail and send auto-response messages. This can be done via the main Account Details screen, as shown here. In this example, I created a rule that sends a reply to the sender of messages addressed to frozen.account@example.com using the “Send a NOTE 1” action. I then entered the $SENDER$ macro and the desired response. This message will be sent back to the message sender in response to a message originally sent to the frozen account. You can get pretty creative with MDaemon’s content filter to perform a variety of tasks, so hopefully you found this helpful! Most of us don’t wake up thinking about email, but without it, business communications would be set back at least 20 years. We rely on email for many basic business functions, so we want email management features that simplify communications & make collaboration easier and more efficient. 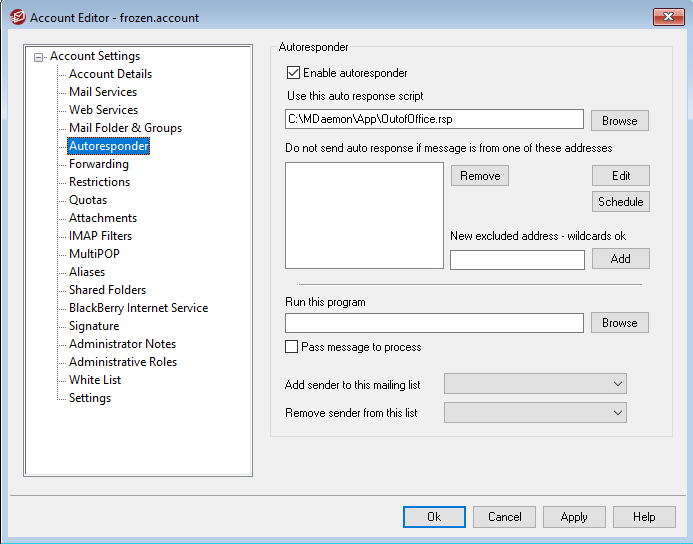 With MDaemon Webmail, users can perform a variety of tasks via the Options menu. But, following the theme of making things easier, did you know you can perform many of these same tasks with the click of the right mouse button without leaving your Inbox? Want to learn more about the many ways MDaemon Webmail helps users stay connected? Visit our Webmail Features page, or download your free trial of MDaemon! Encrypting vs. Signing with OpenPGP. What’s the Difference? Many businesses are responsible for maintaining large amounts of confidential data, including customer records, medical records, financial reports, legal documents, and much more. It’s very common for these types of information to be transmitted via email. So how can you ensure confidential data transmitted via email is kept private? How can you ensure the integrity of transmitted data and that a message actually came from its purported sender? Businesses need to ensure confidentiality, data integrity, message authentication (proof of origin), and non-repudiation (proof of content and its origin). These goals can be accomplished using MDaemon’s OpenPGP message encryption and signing services. Read on to learn more about the differences between encrypting and signing, and when each is used. Businesses need to protect sensitive data and preserve confidentiality and privacy. Whether you work in healthcare, finance, legal, HR or education, chances are you’re familiar with the terms GDPR, HIPAA or FERPA (among others). Businesses that fail to meet these regulations risk data breaches that can lead to lost revenue or legal action, as well as steep fines. To address these issues, businesses can use encryption to make their sensitive data unreadable to unauthorized parties. In addition to data privacy, businesses may need to ensure that a message was not altered during transit, and that it actually came from the purported sender. These tasks are accomplished with message signing (adding a digital signature) using OpenPGP. Much like your handwritten signature, a digital signature can be used for authentication purposes, but also cannot be forged. Data Integrity – That the message was not altered from its original form. Message Authentication (Proof of Origin) – That the message actually came from the purported sender. Non-repudiation – That the sender cannot deny the authenticity of the message they sent and signed with OpenPGP. Encrypting vs. Signing – What’s the Difference? So what are the differences between encrypting & signing? Let’s discuss each. Encryption is the act of converting plain text to cipher text. Cipher text is basically text that has been scrambled into non-readable format using an algorithm – called a cipher. MDaemon’s implementation of OpenPGP encryption uses public key encryption (also known as asymmetric key encryption) to encrypt email messages and attachments. So How Does Public Key Encryption Work? 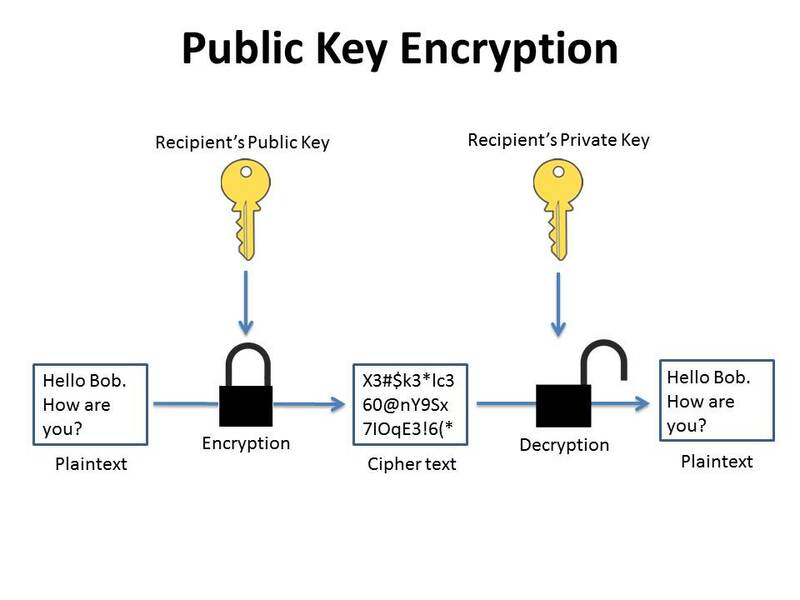 Public key encryption uses public/private key pairs. If you want me to send you an encrypted message, you send me your public key, which I import into my encryption software (using the OpenPGP configuration screen in MDaemon, in this case). I encrypt the message with your public key. When you receive the message, you decrypt it with your private key. Even though your public key can be freely distributed and used to encrypt messages addressed to you, these encrypted messages can only be decrypted with your own private key. This private key must always be kept secret. Data encrypted with the public key can only be decrypted with its corresponding private key; conversely, data encrypted with the private key can only be decrypted with its corresponding public key. We’ll talk about why you would encrypt a message with your own private key in the next section when we discuss message signing. In our latest release of MDaemon, we’ve added the ability for MDaemon Webmail users to encrypt messages from within the message compose window. This procedure is explained in this blog post. Check out the following video to see this process in action! Encrypting a message helps ensure that the message is kept confidential. The message remains in its encrypted format until it is decrypted with the recipient’s private key. What is Message Signing with OpenPGP? As I mentioned above, messages are encrypted with the message recipient’s public key and decrypted with the corresponding private key. 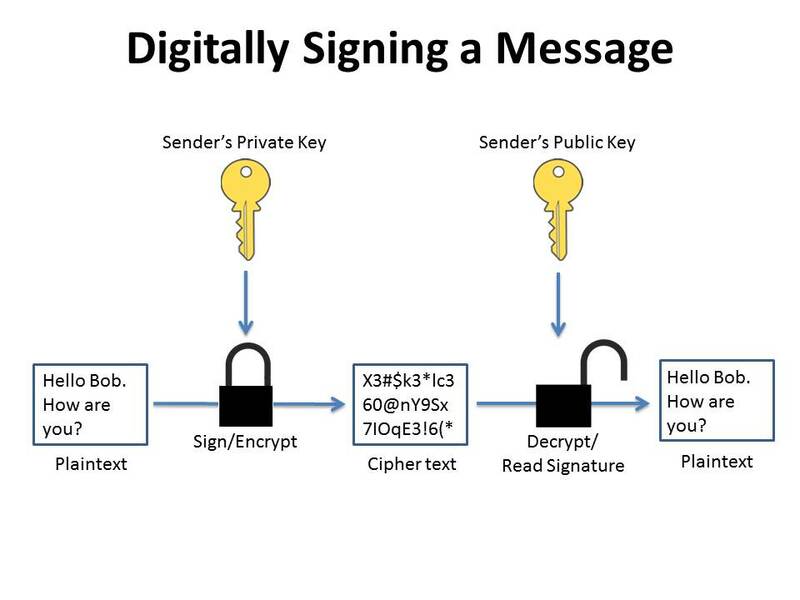 Message signing, on the other hand, uses the sender’s private key to sign (encrypt) the message, and his public key is used to read the signature (decrypt). Message signing binds the identity of the message source to the message. This helps ensure data integrity, message authentication, and non-repudiation. For example, if John wants to digitally sign a message to Michelle, he uses his private key to encrypt the message, and sends it (along with his public key if it hasn’t already been sent) to Michelle. Since John’s public key is the only key that can decrypt the message, the digital signature is verified by simply decrypting the message with John’s public key. Signing a message with OpenPGP ensures that the message was not altered in transit, that it did in fact come from the purported sender, and that the sender cannot deny the authenticity of the message they sent and signed with OpenPGP. Do you have questions? Let us know in the Comments section below!